Private-equity firm TSG Consumer Partners LLC has acquired a minority stake in Ellon, Scotland-based BrewDog, a craft beer brewer and restaurant and bar operator, executives said Wednesday. With the deal, TSG will hold a 23-percent stake in BrewDog, which described the investment as an approximately $265 million transaction, including about $124 million to fund the brewer’s global expansion. The transaction values BrewDog at about $1.2 billion. Known for the Esquire Network TV series “Brew Dogs,” founders James Watt and Martin Dickie are scheduled to open the company’s first U.S. brewery, restaurant and taproom in Columbus, Ohio, later this year. The facility will also be the site of a proposed craft-beer-themed hotel called The Doghouse, as well as a sour beer facility. The hotel will feature beer-related spa treatments, and every room will have a beer tap. Even showers will have a beer fridge, so guests can sip while they bathe, the company said. 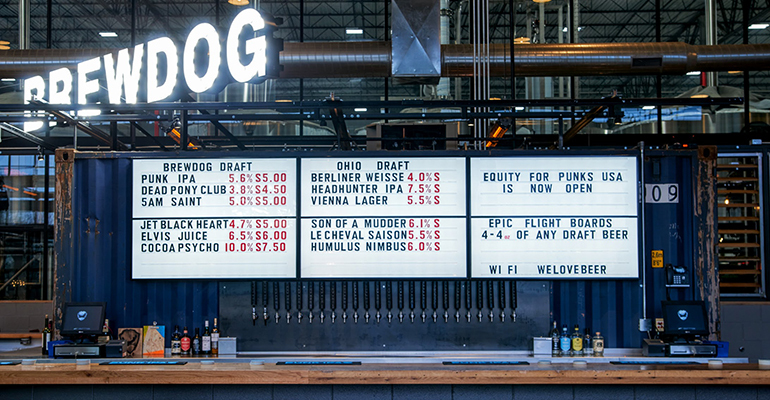 The company has already opened a 300-seat bar called DogTap in Columbus, which debuted in February, to whet consumer appetite for BrewDog beer. The brewer operates about 50 bars around the world. “BrewDog represents an extremely exciting opportunity for TSG as we continue to add to our growing portfolio of European brands, all of which have enormous potential to grow in the U.S. and internationally,” Jamie O’Hara, TSG president, said in a statement. The deal also benefits consumer investors. Early on, BrewDog offered fans an opportunity to buy shares in the company, a program dubbed Equity for Punks, which has raised $50 million since 2009. Shares purchased in the first round, which closed in 2010, are now worth 2,765-percent of their original value, the company said. Other foodservice investments by TSG have included the casual-dining chain Yard House and Stumptown Coffee Roasters.